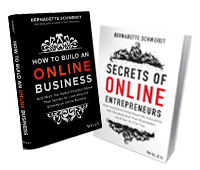 After the runaway success of her first book, Secrets of Online Entrepreneurs, Bernadette’s new book reveals the new and updated strategies Australia’s top digital disruptors use to build and grow their online empires. Uber, Booktopia, Showpo and others feature in this ‘warts and all’ story of how they got started, plus an in-depth analysis of the strategies, tech tools and leadership principles they used to grow their business. Debuting on the "Top 10 best seller list" (Book Scan/Nielsen Ratings) in its first week of release, it's proving to be as popular as her first book. Australia's Online Mavericks, Innovators And Disruptors Built Their Businesses...And How You Can Too. Named in the Top 100 Business Books in 2016 and 2017, this best-selling book received over two dozen 5-star reviews and continues to inspire and educate novice and experienced entrepreneurs alike. Whether you're looking to build a global online business, or just want to make some extra money on eBay, this book will show you how. Based on over 35 in-depth one-to-one interviews with Australia's most successful online entrepreneurs, Bernadette will reveal the insights, the secrets and the little-known strategies behind their astonishing achievements. "Delighted to have been able to provide a little input in this book. Well done Bernadette Schwerdt, an easy and informative read!" ​"​I seriously LOVE this book!